Real gross domestic product (GDP) grew 0.9% in the third quarter, following a 0.3% decline in the second quarter. Exports of energy products, rebounding from a second quarter decline, boosted growth. Growth in final domestic demand decelerated to 0.2%. Exports increased 2.2%, making up some ground lost in the second quarter (-3.9%). Growth was driven by a 6.1% increase in the energy sector, following a 5.1% decline in the second quarter as a result of the Fort McMurray wildfires. Exports of goods grew 2.3%, while services advanced 1.4%. Growth in household final consumption expenditure was 0.6%, a similar pace to the previous two quarters. The growth was mainly in services (+0.9%). Expenditures on goods increased 0.3% despite a 0.6% decline in outlays on durables, particularly motor vehicles. Investment in residential structures (-1.4%) fell for the first time since the first quarter of 2014. Government final consumption expenditure declined 0.3% following a 1.3% increase in the second quarter. Business investment on machinery and equipment fell 3.2% in the third quarter, while intellectual property products declined 4.5% on reduced investment in mineral exploration and evaluation (-26.3%). Investment in non-residential structures rose 3.7%, largely due to the import of a module destined for the Hebron offshore oil project in Newfoundland and Labrador. Businesses added $4.8 billion to inventories, as manufacturing, wholesale and retail inventory levels all increased. Retail inventories of motor vehicles grew by $3.0 billion in the third quarter. Expressed at an annualized rate, real GDP rose 3.5% in the third quarter. In comparison, real GDP in the United States grew 3.2%. Exports of goods and services rose 2.2% in the third quarter, following a 3.9% decline in the second quarter. Exports of goods were up 2.3%, following a 4.7% decline in the second quarter. Exports of energy products grew 6.1%, following a 5.1% decline brought on by the Fort McMurray wildfires and scheduled maintenance shutdowns in the second quarter. An exception was natural gas, natural gas liquids and related products, which declined 3.8%. Exports of consumer goods rose 3.6%, following a 6.4% decline in the second quarter. Metal ores and non-metallic minerals (+5.7%), industrial machinery, equipment and parts (+3.7%) and forestry products and building and packaging materials (+2.7%) also grew. Exports of services rose 1.4% following a 0.3% decrease in the previous quarter. The increase was led by travel (+3.0%) and commercial (+1.0%) services. Imports of goods and services rose 0.8%, twice the pace of the second quarter. Imports of goods rose 1.0% while imports of services were flat. Household final consumption expenditure grew 0.6% after increasing 0.5% in the second quarter. Conversely, durables fell 0.6%, driven by lower purchases of vehicles (-0.8%). Purchases of non-durable (+0.7%) and semi-durable goods (+0.5%) increased. Outlays on services increased 0.9% following 0.6% growth in the previous quarter. Food, beverage and accommodation services (+1.4%) and recreational and cultural services (+2.1%) contributed to the increase. Transport services (+2.5%) were also higher. Expenditures by Canadians abroad rose 1.7% following a 0.9% increase in the second quarter. Business investment in residential structures contracted 1.4% following nine consecutive quarters of growth. Ownership transfer costs (-5.7%), which reflect movement in the resale housing market, contributed the most to the decline. A new tax on home purchases by non-residents in British Columbia came into effect in August, contributing to lower total ownership transfer costs. Investment in new construction (-0.2%) was also lower while renovation investment edged up 0.1%. Business investment in machinery and equipment decreased 3.2% following a 1.0% gain in the second quarter. Business investment in intellectual property products fell 4.5% after edging up 0.2% in the second quarter. Mineral exploration and evaluation (-26.3%) largely contributed to the decline, with reduced exploration activity in oil and gas. Research and development (-2.1%) and software (-0.7%) investment also declined. Investment in non-residential structures rose 3.7%, following seven consecutive quarterly declines. Increased investment in engineering structures (+5.4%), driven by the import of a module destined for the Hebron offshore oil project in Newfoundland and Labrador, was partially offset by lower investment in non-residential buildings (-1.3%). Overall, business gross fixed capital formation decreased 0.5% in the third quarter after edging down 0.1% in the previous quarter. This marks the eighth consecutive quarterly decline. Businesses accumulated $4.8 billion in inventories in the third quarter after adding $531 million in the previous quarter. Non-farm inventories grew $3.6 billion. Manufacturing added $1.6 billion in good to inventories, with stocks of non-durable goods increasing $2.9 billion and stocks of durable goods decreasing $1.3 billion. Retail added $643 million, with lower sales of motor vehicles resulting in a $3.0 billion increase of inventories. Wholesalers accumulated $1.2 billion in inventories, with stocks of durable goods increasing by $1.5 billion. Farm inventories accumulated by $1.0 billion for a second consecutive quarter. The economy-wide stock-to-sales ratio decreased from 0.751 in the second quarter to 0.747 in the third quarter. Household disposable income increased 2.2% in the third quarter (nominal terms). Compensation of employees (+0.5%) grew at the same pace as in the second quarter, while the net property income of households rose 5.1%. Federal government transfers to households increased 5.4%, aided by the introduction of the new Canada Child Benefit program, which came into effect July 1. Personal income tax paid declined 2.5%. The household saving rate rose to 5.8% in the third quarter, as household disposable income increased at a faster pace than household spending. The debt-service ratio was 13.97%, down from 14.14% in the previous quarter. The gross operating surplus of non-financial corporations grew 4.0% following three consecutive quarterly declines. The increase was primarily in the oil and gas extraction and petroleum and coal product manufacturing industries, in tandem with higher energy exports. The gross operating surplus of financial corporations (+46.6%) rebounded strongly following a 30.2% drop in the second quarter. Insurance claims due to the Fort McMurray wildfires contributed to the second quarter decline. Overall, the gross operating surplus increased 6.4% after declining 3.4% in the second quarter. Government revenues edged down 0.3% in the third quarter, while outlays rose 0.8%, leading to an increase in the overall net borrowing position of the government sector. At the federal level, revenues (-1.1%) were pulled down by declining taxes on incomes (-1.6%). Federal expenditures on goods and services declined 2.3%, while current transfers to households increased 5.4%. Measured on a national accounts basis, the federal net borrowing position continued to grow. 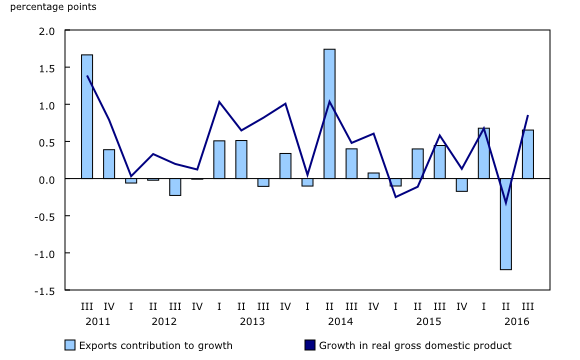 Real gross national income rose 0.9% after increasing 0.4% in the second quarter. Export prices rose 2.1% following three consecutive quarters of decline. Import prices rebounded 1.3% after falling 1.5% in the second quarter, and the terms of trade improved for a second consecutive quarter. 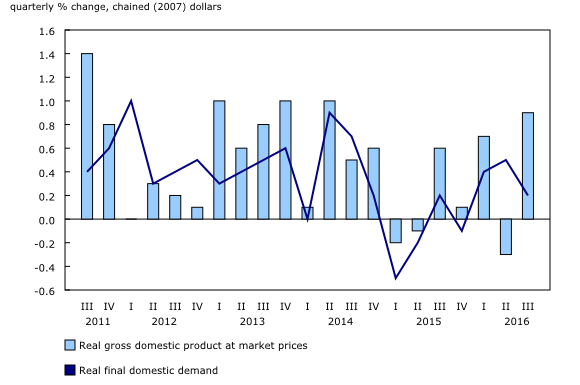 The price of final domestic demand rose 0.4%, while the GDP implicit price index (the price of goods and services produced in Canada) rose 0.6%. 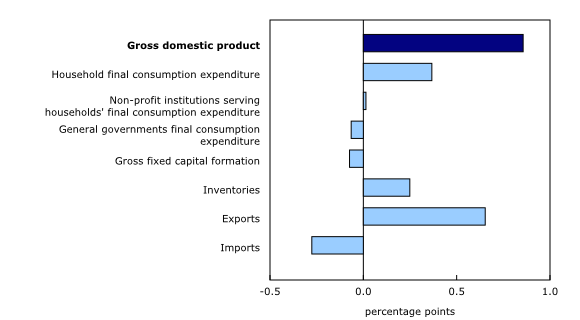 Percentage changes for expenditure-based statistics (such as personal expenditures, investment, exports and imports) are calculated from volume measures that are adjusted for price variations. Percentage changes for income-based and flow-of-funds statistics (such as labour income, corporate profits, mortgage borrowing and total funds raised) are calculated from nominal values; that is, they are not adjusted for price variations. Unless otherwise stated, the growth rates in this release represent the percentage change in the series from one quarter to the next, such as from the second quarter to the third quarter of 2016. Quarterly growth can be expressed at an annual rate by using a compound growth formula, similar to the way in which a monthly interest rate can be expressed at an annual rate. Expressing growth at an annual rate facilitates comparisons with official GDP statistics from the United States. Both the quarterly growth rate and the annualized quarterly growth rate should be interpreted as an indication of the latest trend in GDP. Data on GDP for the third quarter of 2016 were released along with revised data from the first quarter of 2013 to the second quarter of 2016. These data incorporate new and revised data, as well as updated data on seasonal trends. Real-time CANSIM tables 380-8063 and 380-8064 will be updated on December 7. For more information, consult the document Real-time CANSIM tables. Data on GDP by income and expenditure for the fourth quarter of 2016 will be released on March 2, 2017. The System of Macroeconomic Accounts module, accessible from the Browse by key resource module of our website, features an up-to-date portrait of national and provincial economies and their structure. The document "The 2013 to 2015 revisions of the Income and Expenditure Accounts", which is part of Latest Developments in the Canadian Economic Accounts (Catalogue number13-605-X), is now available. The User Guide: Canadian System of Macroeconomic Accounts (Catalogue number13-606-G) is available from the Browse by key resource module of our website, under Publications. This publication has been updated with Chapter 6. Financial and wealth accounts in the Canadian System of Macroeconomic Accounts and Chapter 7. Price and volume measures in the Canadian System of Macroeconomic Accounts.